Today we are guided to manage our stress and anxiety with the help of our Guardian Angel. We often get recurring thoughts and feelings to rest, exercise, make a change etc. and often we put these thoughts aside and push through our day. 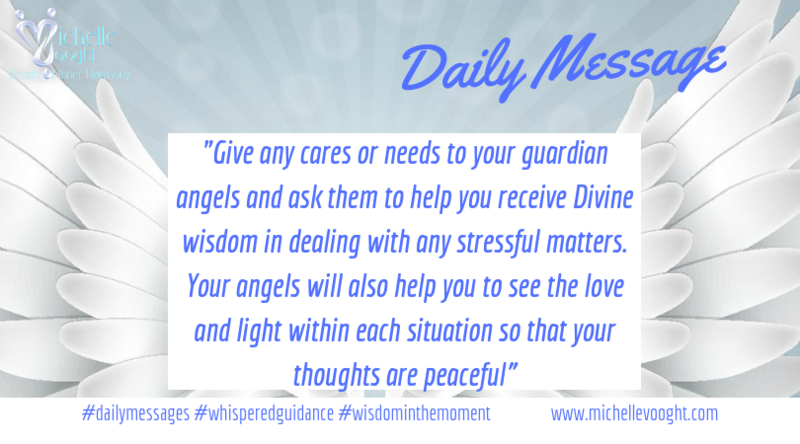 Your Guardian Angel loves to assist you, so ask for help when you need to resolve a situation, talk about it to your Guardian Angel and pay close attention to the thoughts and feelings you then receive. Our biggest cause of anxiety is when we cannot say no, when we feel we are doing things out of guilt or obligation, unresolved conflict and worrying. Make a list of the things that are troubling you at this time and address them one by one, with utmost love and care for your own feelings and those around you. Surround situations that trouble you in love and light, open your heart to see it in a different light. It is not WHAT we say, but HOW we say it, that makes the difference. If the media or news is making you feel fearful or uncertain, avoid this for a while, focus your attention on nature, beautiful environments and positive people. Play uplifting music, put flowers on your desk and talk with understanding friends. Remember to also take care of your physical body and get some rest too.